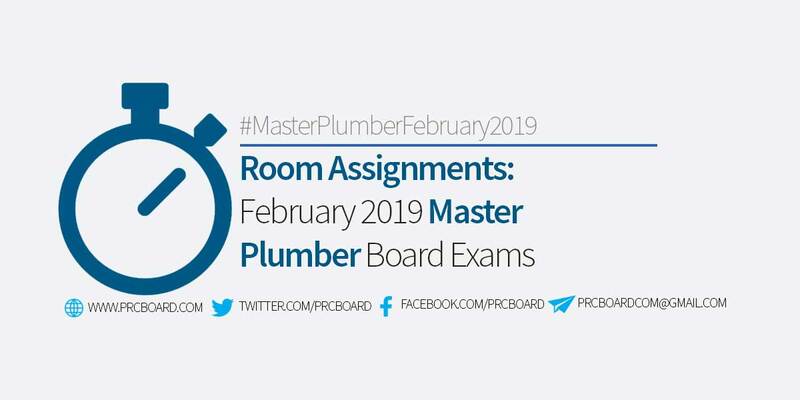 MANILA, Philippines - The room assignments for February 2019 Master Plumber board exams are released by Professional Regulation Commission (PRC) Board of Master Plumber few days before the licensure exam. The board exam is scheduled to take place on February 12-13, 2019 at PRC testing centers in Manila, Baguio and Iloilo. Master Plumber is one of the programs with average number of examinees being administered by PRC. On the most recent exams conducted on July 2018, 626 out of 2,514 examinees passed. Take note of the prohibitions during the exams. These include bringing of books, notes, review materials and other printed materials containing coded information; gadgets which include cellular phones, smartwatch, ear plugs and related electronic devices; any kind of bag. Likewise, PRC will not be responsible for any prohibited items which will be lost during the exams. To receive regular updates about February 2019 Master Plumber board exam results as well as other related announcements, you may refer to PRC official website and follow us at our social media accounts via Facebook and Twitter.